The Greek isle has never been short on crystal blue waters, jaw-dropping views–and hordes of tourists. 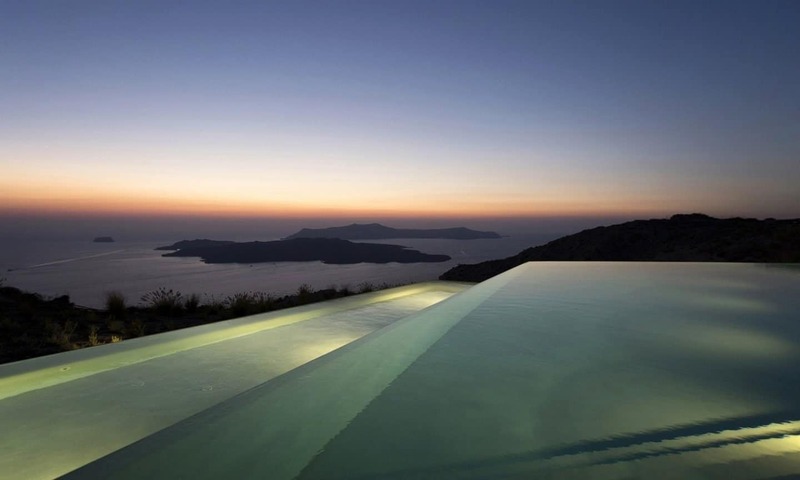 But now a $22,000-a-night Santorini villa offers heaven without the hoi polloi. There is nothing—nothing—that rivals the post-card-perfect scene of a Santorini sunset. Immaculate white buildings set against the shimmering Aegean Sea are what people most often associate with the Greek island, about an hour, or five, from Athens (depending on whether you’re arriving by plane or high-speed ferry). It’s one reason the destination has earned a top spot on must-visit lists of seemingly every type of traveler, from empty nesters to fashionistas to spring breakers to serious globetrotters. 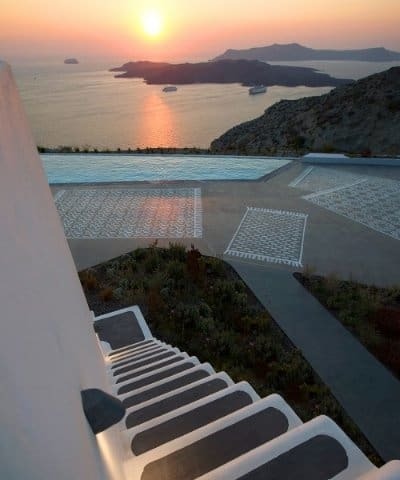 The terraced villa suites catch the remaining moments of sunset over the Aegean. Which is why Erosantorini, a just-completed private estate on the volcanic island, is arguably the best news to come out of Greece since the country received $8.4 billion in bailout aid this summer. Perched on a hilltop 1,000 feet above the Aegean, the property, comprised of a row of whitewashed villas about the size of bungalows, is the kind of place that makes design-lovers—or anyone with good taste, for that matter—weak in the knees. Every inch of space has been carefully considered, from the V-shaped, tri-level infinity pool—the largest on the entire island, designed to give all four villas equal views—to the funky, 1950s-inspired Smeg mini-refrigerators in every room (chosen for their vintage aesthetic and because they produce virtually zero noise). The most unique details, though, are the ones hidden in plain sight: the music playing in the pool that can only be heard underwater; a subterranean hammam outfitted with heated marble floors; a “pool cave” that allows guests to swim while shielded from the beating summer sun. The villa bathrooms are stocked with plush linens and locally sourced amenities. On a breezy September afternoon, Kontomichalos, dressed in jeans, a red polo and topsiders, visits me at the property, still glowing from its “inauguration ceremony” the previous evening. The 10-person event, with guests including the mayor of Santorini, began with a blessing by a local priest and concluded with an exquisite multicourse dinner prepared by the estate’s head chef. 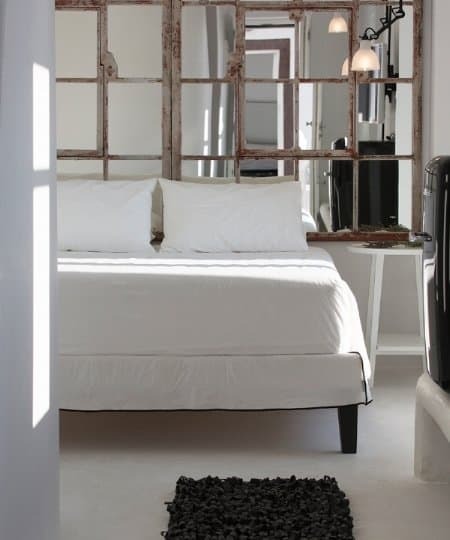 “Greece is not generally known for its great service, but one thing we are known for is great hospitality. If we invite you over as our guest, we’ll bend over backwards for you and do anything to make you feel welcome,” explains Kontomichalos. “In other countries, like Turkey or Thailand or Malaysia, service is delivered in a subservient way. People don’t do that here. We don’t want anyone to feel like they have 20 people hovering around. We want you to feel like you’re at your friend’s place.” It’s a tradition of hospitality so deeply ingrained in the culture, he says, that Greeks have a specific word to describe it: “Philotimo! You need to experience it to understand. Although each of the villas varies in style, they share a unified traditional-meets-modern aesthetic, seen here in one of the suite’s bedrooms.